We can define a Payment Bank in India as a type of bank which is a non-full service niche bank.A Bank which is licensed as a Payments Bank can only receive deposits and provide rim.Lending activities are not permissible for these banks.So, Payment Banks can only issue ATM/debit cards, but can not issue credit cards as they are not empowered to carry out lending activities. 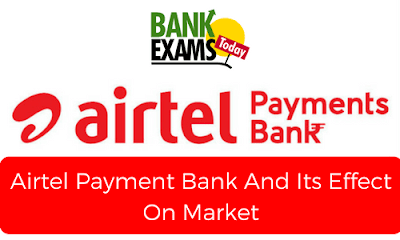 Airtel Payment Bank a joint venture between BHARTI AIRTEL LTD & KOTAK MAHINDRA BANK LTD, said it will spend Rs. 3000 Crore to develop a PAN INDIA banking network & digital payments.The 80:20 joint venture aims to surpass conventional banking system with a virtue to serve multiple purposes under one roof. Mr.Sunil Bharti Mittal, The Chairman of Bharti Enterprises has remarked that Airtel Payments Bank aims to take digital banking services to the unbanked masses with their mobile phones in a quick and efficient manner.Especially youth relies on the home so this could be handy for managing their banking needs. Millions of Indians in rural areas will get their first formal banking experience with Airtel Payments Bank. The Logo unveiled by APB signifies its identity.It is a modified form of Bharti Airtel telecom services.If you cleary observe it is actually the Indian rupee symbol has been inscribed in 'k letter of word 'Bank. On the eve of Airtel Payments Bank launch, Finance Minister Mr Arun Jaitley has said "It is the currency, which has no names attached to it.Our Demonetisation efforts to the extent that digital payment must replace paper currency.APB would provide adequate reply to criticism that cashless economy is about use of credit cards"
A Payments Bank has to keep 75% of their demand deposits in government bonds whose yield is low. A Payments Bank has to open 25% of its branches in unbanked, rural areas. If you watch television, then you must be acknowledging the new commercial of AIRTEL PAYMENT BANK with punch line "Bank hai par alag hai". So why it is different, the features are listed below. 1). APB offers 7.25% interest compared to 3-4% offered by the conventional bank.This feature can fetch a number of customers especially of small sectors, for ex: customers with fewer savings, self-help groups, high-interest small business. high-interest rate, the bank also offers personal accidental insurance of Rs 1 Lakh with every saving account.No doubt, it would be a useful & versatile BANKASSURANCE Product. 3).In this digital era, every person in the world wants to be connected.To serve this purpose, APB offers talk time on saving the account. If a customer opens an account with a deposit of Rs 1000 then he/she will get 1000 minutes of free talktime on his/her Airtel Mobile Number.This talk time can be used for Airtel to Airtel calling all over India.This benefit is applicable on first time deposits only & comes with validity of 30 days. 4).To take a step ahead Demonetisation,t he Merchant partners will accept from Airtel Payment Bank customers over mobile phones. The Payment Bank will not charge any processing fee from Merchants & the facility would be a totally free for customers as well as merchants. Mr. Shashi Arora, MD and CEO, Airtel Payments Bank was quoted saying"One of our big objectives is to create a merchant eco-system. Our aim is to on-board over 3 million merchants by the end of this fiscal. We have kept the transaction fee at zero for merchants. This is because we are replacing cash. The moment there is a charge of even 10 paise, a merchant may get hesitant in using it. We want to ensure that even for smallest value transactions consumers as well as traders use the wallet". Increased risk of Money Laundering: The transfer of money into and out of a mobile wallet from or to a bank account is now possible. Cash-in from the bank account of an individual and cash-out to a different bank account of another individual can be used as a platform for laundering unaccounted money. No Auto Log-off Facility: An individual usually opens the application on his/her mobile device for availing the services and closes the application, instead of logging out. If the mobile device is stolen or lost and a fraudster opens the application, he/she can misuse the remaining balance in the service providers wallet. Airtel Payment Bank definately offers many schemes to woo customers.There is no doubt APB could become people's favourite bank.Now Paytm Payment Bank will also compete with APB. But APB has to face many challenges in sustaining customer hold, since it does not offer lending & to enhance profit of company.